Jin Yao and Kostyantyn Keshyshev in Cinderella. 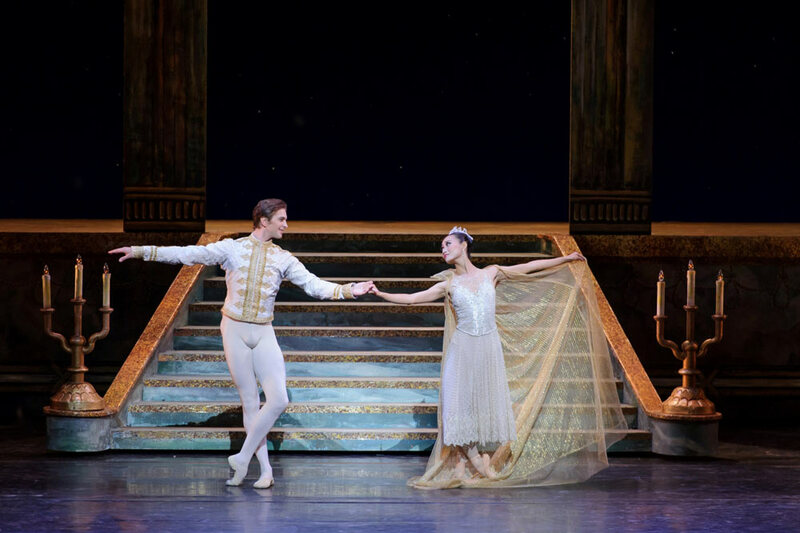 In early September, the Hong Kong Ballet opened its 2012/3 season with a revival of its 2004 Cinderella by the American choreographer, David Allan. This slightly shortened production is effective and well tailored to suit the company at the time. Allen’s choreography is decent overall if in Act 1 the choreography for the divertissements of the Seasons feels rather dull and unmemorable; and the midnight episode in the ballroom act doesn’t make much impact either. But Allen’s best choreography is there when it matters most: for the two pas de deux at the heart of the ballet. The ballroom duet, which contains some soaring lifts, brings the right touch of romance and heart-warming emotion. As I said in my 2007 review, some cuts in this production are questionable, for instance the absence of Cinderella’s father. I wish that Allan had cut instead the three national dances in Act 3 showing the prince’s journey round the world in search of Cinderella, which add little at all to the development of the drama. Ashton was wise to excise them in his classic telling for the Royal Ballet, by far the best production of this Prokofiev ballet. I saw the first cast led by Jin Yao, the top ballerina in the company. Her acting was superb, and her dancing too had a warm glow throughout. In Act 1 she was ravishing in her playful solo with the broom. In Act 2 she was ecstatic in the ballroom duet, and danced impeccably her dizzy solo full of turns. In Act 3 it was touching to see her reminiscing about her appearance in the ball. For a change she had a new partner, due to the unavailability of her two usual partners: Zhang Yao was injured and Huang Zhen has unfortunately left Hong Kong Ballet for South Korea. Jin was strongly partnered on this occasion by the tall Ukrainian coryphée dancer, Kostyantyn Keshyshev. He danced nobly as the prince; his virtuosity in his solo was spectacular. He should definitely partner Jin Yao more often in future. Keshyshev is the finest classical danseur in the company at present, having excelled already in a number of leading roles, especially Albrecht in Giselle last spring. Why he hasn’t been promoted recently to a principal or even soloist, while some lesser dancers have been instead, is a mystery to me. Among the supporting performances, Zhang Si Yuan was sharp and precise in the winter fairy solo, while Shen Jie dazzled as the jester in the ballroom. The colourful sets and costumes by Peter Cazalet are rather tasteful. The costumes for the frogs in the Act 1 seasons’ divertissements in particular delighted the children in the audience. Actually I don’t understand why the Hong Kong Ballet cannot show this production of Cinderella occasionally during the Christmas season. It doesn’t have to be The Nutcracker every year. After its well-received tour in July to North America, the company will also travel to New York at the end of September to appear in the Fall for Dance Festival in New York. For this brief engagement they will bring only Peter Quanz’s masterly ballet, Luminous, created in 2010 for eight dancers of the company.